Total employment in the nonfarming sector has seen a considerable rise in the month of December. The nonfarm sector witnessed an addition of 312,000 jobs, which in comparison to November (added 155,000 jobs), is substantial growth. The rate of unemployment, however, increased in December from 3.7% in November to 3.9%, in spite of the job additions. The employment situation in December has also influenced by major government decisions such as the partial Federal Government Shutdown. The month of December saw an increase of 0.2 percentage points in the unemployment rate. By the end of the month, the number of unemployed people was increased by 276,000, taking the overall unemployment figure to 6.3 million. This indicates a marginal increase in the number of unemployed persons from the previous month, which stood at 6 million. 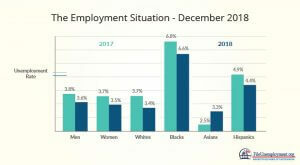 The situation during December 2018, however, still appears to be an improvement from the situation prevalent in December 2017, when the United States had 6.6 million unemployed persons at this time. The unemployment rate of various groups gives a broader picture of how the country has fared when compared during the same time, last year. The above representation shows that the rate of unemployment has decreased in 2018 when compared to 2017. However, the numbers in December have marginally increased compared with the previous month. The month of December witnessed a minor change in the data of job-leavers and those who are long-term unemployed. Job-leavers are those who have quit their jobs and have immediately started looking for a new job, and long-term unemployed persons are those who have not been employed for at least 27 weeks or more. The number of job-leavers has increased by 142,000 in the month of December, which takes the overall tally for the year to 839,000. On the other hand, the number of long-term unemployed has seen a marginal decrease, coming down from 20.8% of overall unemployed to 20.5%. Coming to the situation of labor force participation rate and employment participation ratio, there have been some minuscule changes. The data for December shows that the former has seen a marginal increase from 62.9% in November to 63.1%, whereas the latter remained unchanged for the third consecutive month, standing at 60.06%. The number of persons who are marginally attached to the workforce and the number of persons employed part time for economic reasons too have come down in December. The number of persons who are marginally attached to the workforce reduced from 1.7 million in November to 1.6 million in December, and the persons employed part time for economic reasons came down from 4.8 million in November to 4.7 million. Also, it is worthwhile to note that the number of discouraged workers, those who believe that there are no jobs for them at present, has come down by 99,000 from 2017. The total increase in the non-farm payroll employment for the month of December has doubled from November. The total increase in the month of November was 155,000, whereas a total increase in December is noted to be 312,000. Much of the job-gain has occurred in healthcare, manufacturing, food services, construction, and retail. Continuing the growth from November, the healthcare sector has been a leading employer in the month of December as well. The sector has added nearly 50,000 jobs in the month of December. Within the healthcare sector, major recruiters have been ambulatory services (adding nearly 38,000 jobs) and hospitals (adding 7000 jobs). The total number of people recruited by the healthcare industry in 2018 is 346,000. Construction and manufacturing have contributed 38,000 and 32,000 jobs respectively in December. Within the construction industry, job gains were made by nonresidential trade construction and civil engineering (both adding 16,000 jobs respectively). Within the manufacturing industry, a large number of jobs were added by manufacturing durable goods component (added 19,000 jobs) and manufacturing fabricated metal products (added 7000 jobs). The construction industry added a total of 280,000 jobs in 2018, and the contribution from the manufacturing sector stands at 207,000 jobs for the year. Due to the increase in recruitment by the general merchandising stores (adding 15,000 jobs) and automobile dealers (adding 6000 jobs), the overall retail sector has added a total of 24,000 jobs to the American economy in the month of December. However, the employment rate in sectors such as mining, wholesale trade, transportation and warehousing, information, financial activities, and government remains unchanged in December. This suggests that those who are on the lookout for a new employment opportunity, healthcare, manufacturing, constructing and retail are recruiting in large numbers, as opposed to other industries in the country.